The Middle Ages encompass one of the most exciting periods in English History. The names of famous Kings scatter the History books. But behind every famous King of the Middle Ages was a famous woman - the Medieval Queens or Princesses. But a few other women in the Middle Ages are also remembered in history as great writers, artists and religious icons. Other women found fame because of their great beauty and their roles as a mistress of a king of England. This section provides access to the short biographies of women who achieved fame in an era that was dominated by men. The famous Middle Ages Women included Joan of Arc, Katherine Swynford, Margery Kempe, Anna Comnena, Heloise, Hildegard of Bingen, Christine de Pizan, Julian of Norwich, Jane Shore, Alice Perrers and Lady Godiva. Facts and interesting information about famous women during the Middle Ages. The Medieval women of the Middle Ages had to be strong their lives cover the vicious Medieval periods from 1066 - 1485. Learn about the Mystics and the Mistresses, the Rich and the poor women of the Middle Ages. The women of the Middle Ages were totally dominated by the male members of their family. The women were expected to instantly obey not only their father, but also their brothers and any other male members of the family. Any unruly girls were beaten into submission and disobedience was seen as a crime against religion. The following section details the life, marriage and children of noble women in the Middle Ages. The following links provide interesting facts and information about the clothes and fashions worn by Middle Ages women.. The clothes worn by women varied according to the social standing of the person. The clothing worn by the Queens and noble Ladies was totally different than the clothing worn by women of the lower classes. The Middles Ages was a violent period dominated by men and wars. The names of the famous women of the Middles Ages have found their place in history as scholars, artists, through their religion or in their roles as the mistresses of great men. There are facts and short biographies of Joan of Arc, Jane Shore, Alice Perrers Katherine Swynford, Margery Kempe, Anna Comnena, Christine de Pizan, Heloise, Hildegard of Bingen, Julian of Norwich and Lady Godiva. Facts and a short biography with key dates about Joan of Arc who was famous as the Maid of Orleans who roused the French against the English during the Hundred Years War and was eventually burnt at the stake. Facts and a short biography with key dates about Katherine Swynford who was famous as the beautiful mistress of John of Gaunt. The couple eventually married and their children were legitimised. Katherine was therefore the ancestor of the Tudor dynasty. Katherine Swynford was also the sister-in-law of Geoffrey Chaucer. 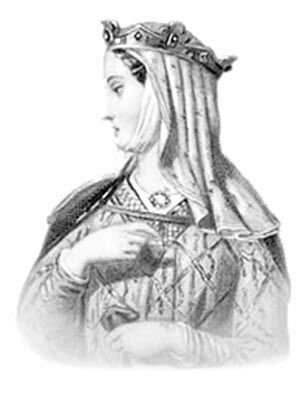 Facts and a short biography with key dates about Anna Comnena who was a famous author and the daughter of Emperor Alexius Comnenus of the Byzantine Empire. Anna Comnena is considered the world's first female historian. She wrote and dedicated a 15 volume book, called the Alexiad. Facts and a short biography with key dates about Heloise who was famous as the lover of Peter Abelard who was castrated as a result of their doomed love affair. Facts and a short biography with key dates about Christine de Pizan who was highly intelligent author who not afraid to speak her mind. Facts and a short biography with key dates about Jane Shore who was famous as the beautiful and kindly mistress of King Edward IV of England during the period in history known as the Wars of the Roses. Facts and a short biography with key dates about Alice Perrers who was famous as the greedy, unscrupulous mistress of the aging King Edward III. Facts and a short biography with key dates about Margery Kempe who was famous as the the author of the first autobiography in English called 'The Book of Margery Kempe' that detailed her pilgimage to the Holy Land. Facts and a short biography with key dates about Lady Godiva who was famous as the woman who rode naked on a horse through the Medieval town of Coventry. All the townspeople stayed inside during her ride, except one man called Tom - hence the expression "Peeping Tom"
For facts and information about the daily lives of religious women (nuns, anchoress and convents) and other women in the Middle Ages including peasants and the Lady of the Manor please refer to the Middle Ages Sitemap. Each section of this Middle Ages website addresses all topics and provides interesting facts and information about these great monuments to bygone times. The Sitemap provides full details of all of the information and facts provided about the fascinating subject of Middle Ages!